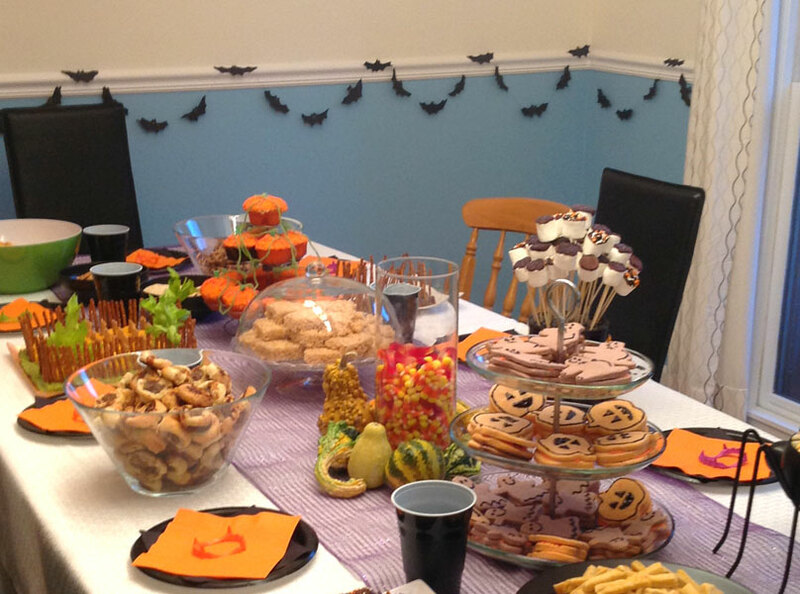 Here are a few more recipes from Chicago teen’s Pinterest foodie Halloween party this past weekend. In a food processor whip the cream cheese with the brown sugar until it is light and fluffy. Slice the apples into thin wedges and toss with lemon juice… this stops the apples going brown. Spread the cream cheese mixture in the center of a round plate. Top with caramel sauce then Heath toffee bits. 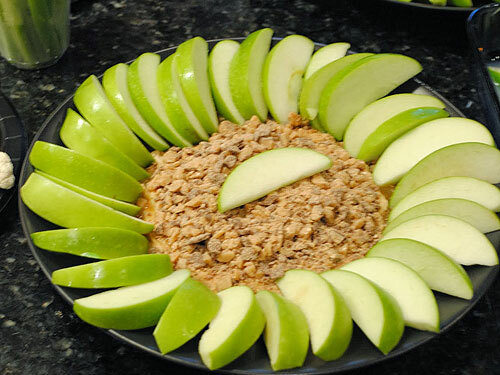 Arrange the apple slices around the dip. Cream the margarine and sugar together in a food processor until it is light and fluffy. Adds eggs and vanilla then the flour. Spoon mixture into cup cake liners. Bake at 350 deg F for 20 minutes. Once the cakes are out of the oven and cooled ice with orange frosting and dip into orange sugar. Then with a skewer make seven indentations around the cake radiating from the center. Pipe a line of orange frosting into these indentations. 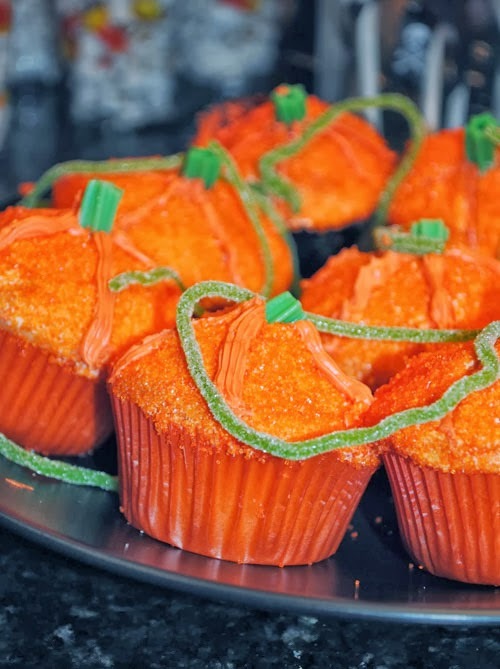 Top each cake with a green twizzler peice for the pumpkin stalk. Plate up and decorate with green lace candy for pumpkin tendrils. In a large sauce pan add the oil and popcorn kernels and heat to pop the popcorn. Shake the pan constantly to stop the popcorn burning. 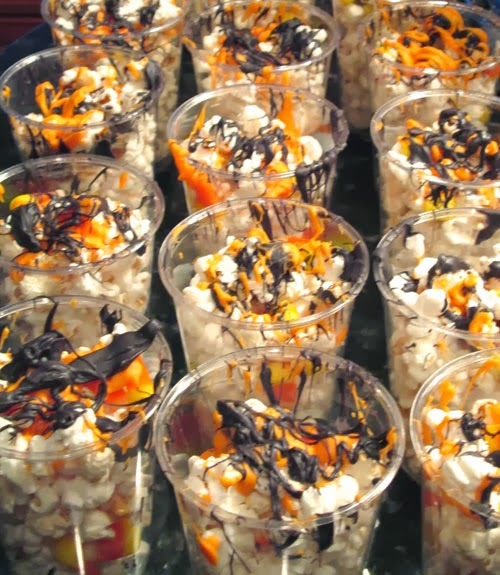 Season lightly with salt and fill simple cups with popcorn and a few candy corn sweets. Melt the candy melt and drizzle over each cup with a fork. Great for watching scary movies! More recipes to come( here)…I told you Chicago teen made a lot of food! 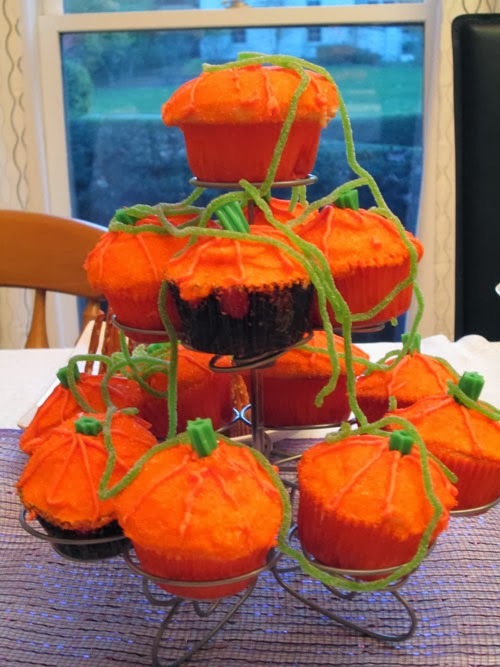 This entry was posted in Celebrate in Style, Food, Halloween, Holiday Projects, Teenager. Bookmark the permalink.